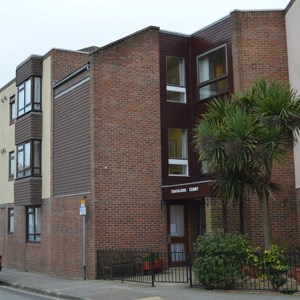 Trafalgar Court opened in 1980 and finished a comprehensive remodelling programme in 2011 that increased the number of one bed-roomed double flats and converted the remaining single studios into lovely one bed-roomed flats. Situated in the centre of Southsea, it has easy access to buses, GP, shops and post office. Facilities include: communal lounge, shared laundry facilities, hairdressing salon, a guest bedroom and lift to first and second floors.